The CAB wall mounted polycarbonate hinged enclosure features both opaque or clear cover options, and quick release pad lockable latches. CAB enclosures are ideal for mounting and housing operator controls and process controllers. Tough, impact resistant polycarbonate withstands harsh and demanding environments. Ranging in size from 8″x12″x7″ to 23″x15″x8″ this NEMA 4X watertight enclosure is the ideal non-metallic electrical cabinet enclosure for both indoor and out applications. This polycarbonate enclosure easily handles harsh environments. 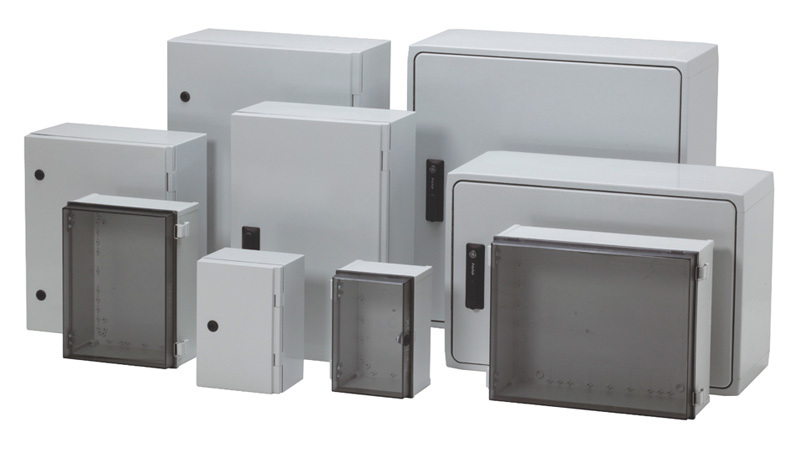 These UL listed NEMA 4X non-metallic enclosures feature European styling and will outlast fiberglass enclosure counterparts. With custom cutouts and colors available and all the standard hardware and accessories, you could need Fibox can easily customize your CAB polycarbonate enclosure and truly make it unique to your application needs. For larger cabinet enclosures from Fibox check out the ARCA-IEC cabinet enclosure , the largest polycarbonate cabinet enclosure in the marketplace. Contact Fibox to learn more about CAB series cabinet enclosure!